A staffer visits Project Return participants working at a local construction job site in 2016. Listen to the radio version of our story. Felons find themselves in a precarious position when they walk out of prison — they often have limited work experience, a criminal background and no time for extensive training. Whether they will return to prison — or not — can come down to one big question: Can they find a job? Without it, it is nearly impossible to get back on their feet, secure housing or meet the requirements of parole. A Nashville non-profit is experimenting with a solution: paying former inmates to get certified in construction so they can take advantage of open jobs in the city. One of the first jobs someone might have in a construction site is measuring and cutting plywood. An instructor guides one of the students using an electric saw. A few classmates hover around, offering advice. Others joke around and smoke in the shade nearby, waiting their turn. A group of construction students at Project Return look on as their instructor demonstrates how to properly use a planer to finish wood. For two weeks they meet like this, spending the afternoons outside. Last week they built a fence. The mornings are spent in a classroom, learning basic safety, rigging and blueprint reading. They should be able to put these skills to use quickly says Mark Dunlap, Project Development Coordinator at Project Return. He builds relationships with potential employers and oversees the program. Hoping to fill one of those openings is Nicole Worthy. She is eager to reunite with her daughter, who was placed in foster care after her arrest last year. Worthy must be employed before she can begin petitioning the state for custody. The job hunt hasn’t been easy. "I sat one Saturday by myself and called 25 places," she says. "And out of the 25 places, only 5 would talk to me. After I went through the process of applying and talking to the recruiters, they shot me down." The rejection is new for her. Until last year, she’d never been in trouble. Now she says she understands how quickly someone’s life can unravel. But at least she has a place to stay. One of her classmates sleeps outside on a bench. Another works a temp job at a warehouse all night so he can spend the day in class. Bettie Kirkland is Project Return’s executive director. She says almost everyone that walks through their doors is starting from scratch. When they are released, felons often walk out with just “the clothes they were wearing but likely no money, no phone, no ID and no place to live,” she says. For many, Project Return is their first stop. Project Return has been placing felons into jobs for years. But Dunlap says less than 15 percent actually got hired in construction even as the need for workers grew. The non-profit began communicating with contractors regularly, finding out what skills were most coveted and where they were falling short. It was clear something needed to be done to strengthen faith in their candidates. They decided to become an accredited training site, hiring an instructor and purchasing a curriculum. It was a hefty investment — books, supplies and tools had to be bought — but so far, it has paid off. Where a similar course may run 6-8 weeks elsewhere, at Project Return it’s condensed into two. Kirkland says the extra time is a luxury their students simply can’t afford. To relieve some of that pressure, project return began offering a $50 stipend, paid daily. It allows the students to focus on learning without worrying about their next meal. That’s an opportunity that many have never had. There’s only one caveat: To get paid, they have to be on time. Every day, a few minutes past 9 a.m., the sign-in sheet is picked up. It may seem harsh but coordinators say the course prepares former inmates not just to find their next job, but to keep it. Statistics shows that more than half of all formerly incarcerated people are still unemployed a year after their release. The Sentencing Project reports that 87 percent of all employers conduct background checks to screen potential employees. 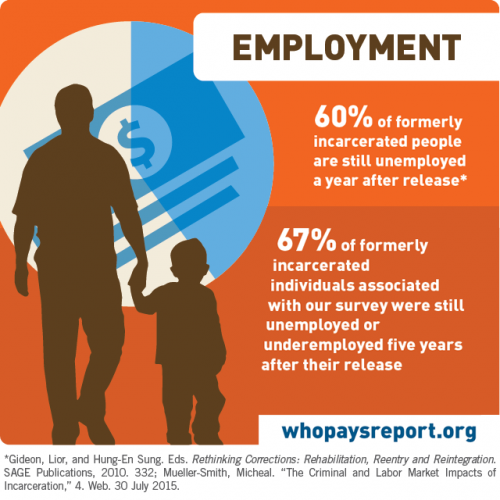 For someone with a criminal record, losing a job can result in long periods of unemployment. More than 60 percent of formerly incarcerated people are still looking for work a year after their release. Construction isn’t a long-term career goal for all the students. One of Worthy’s classmates wants to go to beauty school and get licensed as a barber while another hopes to regain his commercial driver’s license. One of the older students is working on going back to college. He wants to be a social worker. But in the meantime, a construction job can offer some stability. Wages at local job sites can easily start at $15 an hour. That’s twice the going rate for working at a fast food joint. The program over all has been a success. Local companies have begun visiting, scouting for skilled future employees. That’s far cry from the cold calls and rejections that Nicole encountered. Kirkland says the difference is in meeting the students — and seeing them beyond their mistakes. The recidivism rate for Project Return participants has hovered below 15 percent for years. In comparison, nationally about half of all released convicts return to prison, but that number may be even higher. Project Return is now considering applying the paid model to their other hard skill programs. As for Nicole, she’s says she found the support she didn’t have before going to prison and hopes to find a permanent place in the construction industry. So far, half of all students have landed jobs in the field. And more importantly, they’ve remained out of prison. It's no secret that the construction industry in Nashville is struggling to find workers. Contractors say they have more jobs than they can fill. Some even post "help wanted" signs on their construction sites. The biggest challenge, industry leaders say, is making the next generation aware of the work and prepared to do it. Rodney Northington is an unlikely person to be telling folks who live in the James Cayce housing projects to put down their guns. He’s a convicted felon, a former drug dealer and at one-time a high-ranking gang member. But he’s also, quite possibly, the perfect man for the job.